Watching Alan Alda’s interview on CBS this morning was inspiring and uplifting. Mr. Alda could possibly be the best celebrity spokesperson, after Michael J Fox, for getting the word out that Parkinson’s is not a death sentence. In a 7 minute interview, he covered so much of what my fellow bloggers and I have been writing about, and the most important message he gave is to “keep moving.” I can’t repeat that message often enough, because it has worked so well for me and many other Parkies that I know, for the last 10 years. Alda insisted that his doctor test him for Parkinson’s after reading an article about how one of the early signs of Parkinson’s is acting out dreams, which he was doing. One of his first symptoms a short time later was a twitch in his thumb. His reaction was not fear. He wanted to help his family understand the disease and stressed that each person with Parkinson’s experiences the disease differently, even from day to day. He sees PD as a puzzle to be solved. You have to figure out the pieces of the puzzle that work for you to carry on a normal life. It is a challenge that you must meet and you have to find a way to approach it. He enjoys solving puzzles, something that I enjoy as well. Alda approaches life with enthusiasm and hopefully will inspire others to do as he does: keep on moving. He boxes 3 times a week, plays tennis twice a week, and marches to Sousa music. He says that marching to music is very powerful for PD. Most importantly, he wants to get the word out that Parkinson’s Disease should not be feared and that there are things you can do to live well with PD. I hope that Mr. Alda will consider coming to the World Parkinson’s Congress next June in Kyoto. His message of hope is powerful and it needs to be shared with the Parkinson’s community and with the world. i am a long term fan of Alan Alda and his positivity is encouraging. My concern is that major media outlets like CBS and NPR choose the quote, “I’m not mad.” I have met a lot of people who have Parkinson’s and can’t think of anyone who is mad about it. Sad, yes. Mad, no. Also, why would someone who, at 82, has already outlived his life expectancy be mad that he has a disease but can still play tennis and box? MJ Fox had his career cut short by Parkinson’s and is very positive but so are support group friends who were diagnosed with Parkinson’s before they were 40 and have struggled to raise their families in the poverty and anxiety caused by not being able to earn a living wage due to their symptoms. I am also a positive person with PD but my life is not that hard. My healthy husband didn’t leave me which is common in YOPD families. I can afford a tennis club membership and coach, help cleaning the house, uber, etc. If I could nominate someone to speak at Kyoto, it would be one of these people who are giving time and energy to support others despite all that has been taken from them. 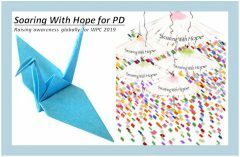 Kim, while I agree with what you say about having someone with YOPD speak about their hardships with the disease, what Alan Alda has given us with his announcement is the power of someone well known giving the right message about PD. So many others have “come out” about their diagnosis, but have done nothing to encourage change in the global perception of what Parkinsons looks like and what can be done to combat it. Linda Rondstat and Neil Diamond, just to mention a few, could have done more but chose not to. We need more people with influence to show that we can stand up to Parkinsons and live well longer with it if we get an early diagnosis, see the right kind of doctor and keep exercising. Unfortunately too many people with PD are being treated by a general practitioner who is not up on the latest treatments because they don’t know that there are better options for them. Someone like Alan Alda can hopefully encourage them to see a neurologist, or even better a Movement Disorders Specialist and get the right treatment.